President of Bangladesh hold the post as the chancellor of the university, but he has only ceremonial role. 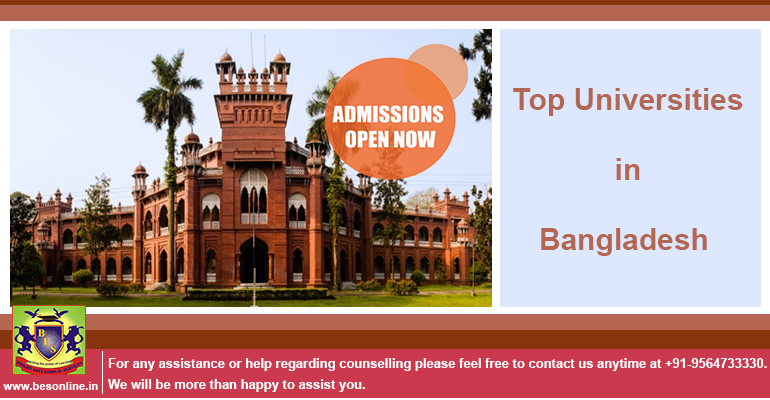 There are 5 Medical Universities in Bangladesh which are recognized and approved by Medical Council of India (MCI). It was established in 1921 and it is one of the oldest and also largest public universities of modern Bangladesh and it had played significant part in making of today’s Bangladesh. It has 13 faculties, 71 departments, 10 institutes, 17 dormitories, 3 hostels and also more than 38 research centers. Library of the University has three different buildings and it is the biggest in Bangladesh comprising of 617,000 volumes. Notable alumni include Muhammad Yunus, only Noble Prize winner from Bangladesh, Fazlur Rahman Khan as well as presidents, prime ministers, artists, journalists and businessmen of Bangladesh. There is a medical center which provides 24×7 service and a dental unit, eye unit, X-Ray department and two ambulances. 12 government and 39 private medical colleges are affiliated through Dhaka University. Also Read CBSE Has Released The Date Sheet For Class 12; Check Board Exam Dates Here! It is the first private university in Bangladesh established on May 13, 1989 with sponsorship of a private charity. The university has different hall for female and male students and a separate hostel for internees. It has seven-storied library building which has three sections and provides modern technology with 150 readers at a time can accommodate. When the university established 1989, there were only two professors and nine lecturers. Now there are 285 full-time teachers. The university has 4,200 students. Which include over 30% foreign students who are from India, Nepal, Malaysia, Sri Lanka, Bhutan, Jordan, Palestine, USA, among others. It is a Public University established in 1953. It is the second largest university in Bangladesh. There are 52 departments in the university distinguished into 9 faculties. The university is in 3 km2 campus in Motihar with comprising of around 25,000 students and approx. 1000 academic staff. The funding comes from government as it is a public institution. Rajshahi University Act was passed in 1973 to run the university accordingly; it helped the university to get more autonomy than most other peer institutes. In 2017 of Bangladesh University Ranking it was ranked third. Fazlul Qadir Chaudhry is the founder of the university on 3 December 1965, in Chittagong city. Later, it was established in 1966 as public university. Approximately, there are 22,000 students and 750 faculty members. It is located around 22 kilometres north of Chittagong city in Fatehpur Union, Hathazari Upazila. Affiliated and recognized by Association of Commonwealth Universities. The University was established in 1987. There was improvement seen in the quality of education after semester system was introduced by the university in 1996-97, which was visible even in the national arena. Every student of the university has to take two language courses, i.e. Bangla and English. Students also have to take two computer courses, one for computer literacy and the other to learn a computer language. Physics, Chemistry and Economics, were the only three departments in the university in 1991 at the time of its journey and had only 13 teachers and 205 students. University has grown to now 7 schools, 27 departments, 2 institutes and many centers. The number of teachers also increased to 487 and the students to 9262. There are 8 affiliated medical colleges under the university consist of around 2744 students. Integrated honours were introduced first time in Bangladesh by the university. Shiv Nadar University PhD Admission 2019 – Notification Released! JUIT Waknaghat M.Sc. Admission 2019 – Notification Released!